Don’t get me wrong; there’s been evenings in the park with a bottle of rose, outdoor music concerts and games of Twenty20. But overall, London is putting on a terrible summer show this year. There’s something wrong with Britain. Everyone knows it and everyone is talking about it. We’re all up the creek without a paddle and we probably should have been more prepared for it. We should have had our bags packed and ready, tickets printed, and accommodation booked for somewhere in Europe. No one wants to be in Britain right now. Now that we’re in the first week of August, I’m already forgetting about it: that wild, warm weekend at the beginning of May, when we rejoiced the notion that summer had come early this year and we would be enjoying sunny days for months to come. Do you remember it? Do you remember the first weekend in May? You were probably sunbathing in Spain and had no idea that you were missing out on London’s only summer fling. It was a long weekend and those who left it too late to get a cheap RyanAir flight out of the country celebrated as temperatures jumped to 22 and 25 degrees Celsius. It’s a distant memory. A legend. Did it even happen? Did London even have a summer? I’m sure there have been days that I wore a summer dress and sandals. But, with May temperatures falling to 12 degrees Celsius more often than they reached above 20, could we be sure that it really happened? Since 2012, this is my first summer in London that we’ve missed out on that glorious “heat wave” all Aussies in London dream of. The days where we boast to our colleagues, “you call this a heatwave? This is what it’s like for eight months of the year in Brissy!” and follow the summer-ready crowds to the closest patch of grass that is not already taken up with picnic rugs, shirtless men playing football and people filling plastic cups with cider and Pimms. 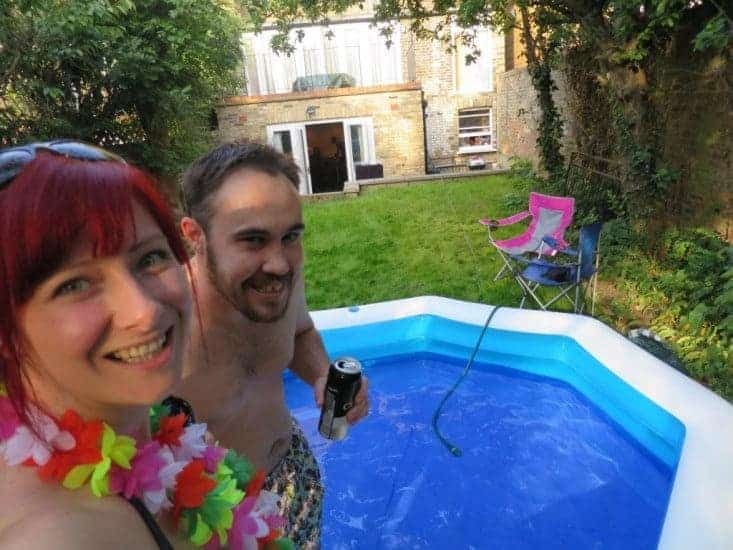 In last year’s heat wave (picture three days in a row where temperatures soared to 30 degrees Celsius), I dashed home from work via Argos to purchase a large paddling pool for our back garden. That afternoon we had a BBQ and enjoyed getting our feet wet – it was simply delightful! This year, I had to get out my TOG 11 duvet out from under the bed only week after I put it away. Clearly, I got a little too excited too early about a warm summer. I think I’ve worn a scarf almost every day this year – and not because I’m trying to be fashionable. I even had the hot water bottle out one day to warm my cold toes after a walk through the local park. Am I being a little too harsh? Am I’m forgetting that week in July when we were finally surprised by temperatures between 27 and 30 degrees? No. Don’t get me wrong; there’s been evenings in the park with a bottle of rose, outdoor music concerts and games of Twenty20. But overall, London is putting on a terrible summer show this year. It’s just not cricket! Pack your bags and run away to somewhere with sweltering hot days, sunny skies and inviting blue seas. I hear Malta, Spain and Croatia are good this time of year. Or, if you’re like us and you’ve used up the majority of your annual leave on winter holidays and the mudfest that was Glastonbury, check out London’s summer pop-ups, street food markets, gin bus and hundreds of indoor exhibitions at some of the best museums and galleries in the world. You can see the Natural History Museum’s Colour and Vision, Beatrix Potter’s work at the V&A or original artwork from Roald Dhal’s BFG at the House of Illustration. You can also pay a small fortune to go to see summer blockbusters like Ghostbusters, The BFG or Finding Dori at the cinema (sadly, the review’s for Suicide Squad featuring our very own Margot Robbie have been pretty dismal).